Beef stew is a nutritious dish you can make easily in the Crock-Pot. 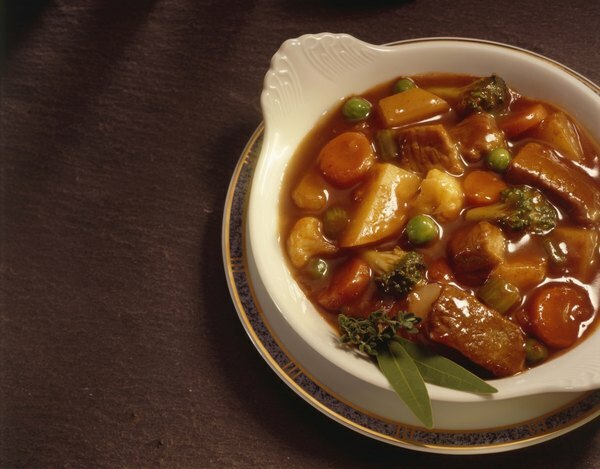 Home-cooked foods like beef stew are healthy additions to your dog's diet. Beef offers protein and fat, while the veggies have a range of vitamins, minerals and antioxidants. This easy recipe allows you to just get the ingredients ready to go, and the Crock-Pot does the rest. Set Crock-Pot to high. Add water. Wash all vegetables. Choose carrots, celery, green peas, green beans, zucchini or yellow squash, or a combination of tasty veggies, along with your potato or sweet potato. Chop all vegetables and potatoes into bite-sized pieces on a cutting board then add them to the Crock-Pot. Rinse the beef, cut it into bite-sized pieces and add it to the Crock-Pot. Set to "low" if you will be out of the house. If you're home, cook on high for first hour, then set to low. Or, if you don't like to leave things on while you're gone, wait until your day off, set on "low" and enjoy the aromas all day. Allow stew to cook for several hours or until the beef is tender. Cooking times vary depending on temperature setting, but general estimates are four to six hours on high or eight to 10 hours on low. Add water if needed along the way. Avoid using too much, if any, salt in this dog-specific recipe. If you are unsure whether a specific vegetable is OK for Fido to eat, research it first. Traditional beef stew often includes onions, but skip these for your dog's version, as onions are toxic to dogs. Beef doesn't agree with some dogs. If your dog hasn't had much beef before, give him a small amount first to make sure he is OK with it. Always allow all foods to cool completely before serving to your dog. Do Cats Have Nerves in Their Tails? Are Garlic and Chives Toxic to Cats?